Pho­tog­ra­phy pod­cast #116 fea­tures an inter­view with Ger­man land­scape pho­tog­ra­pher Michael Bre­itung where we talk about why and how to do focus stack­ing in pho­tog­ra­phy. Basi­cally focus stack­ing involves tak­ing mul­ti­ple frames of the same scene but each frame is focused at a dif­fer­ent part of the image. Then these frames are blended together using a graph­ics pro­gram like Gimp (free) or Pho­to­shop (expen­sive). The result is sharp­ness and depth of field on steroids that can’t be matched by any cam­era lens com­bi­na­tion on a 35mm DSLR cam­era at the time of this writ­ing. Only tilt shift lenses can com­pete in this extreme sharp­ness arena, but those lenses require many saved dol­lars or a rich uncle. This tech­nique is free if you have the skills and a graph­ics program. Scroll to the BOTTOM of this post to find the player to imme­di­ately lis­ten to the audio podcast. 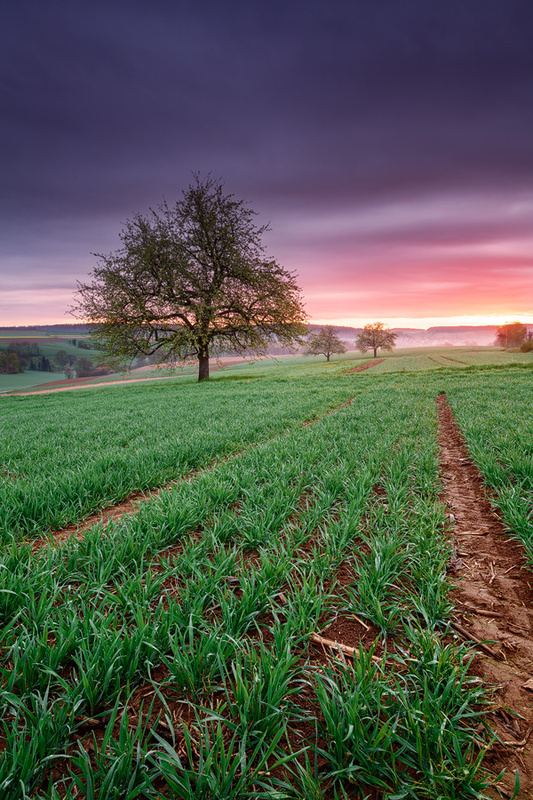 Kraich­gau at Dawn Details — Close up com­par­i­son by Michael Bre­itung — Only 2 frames were needed to cre­ate the final full-sized image above this one. One frame (left) focused at the fore­ground cor­ners, gets the cor­ners sharp in the final image. 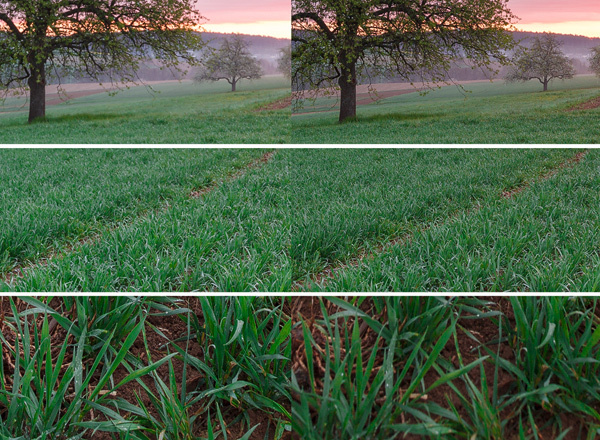 The other frame (right) focused at the midground, gets both the midground and the back­ground sharp. Then the frames are blended in Pho­to­shop to pro­duce the final image. The aper­ture used here was f/11. Michael Breitung’s (advanced) start to fin­ish tuto­r­ial on his (Lightroom/Photoshop) post-processing work­flow and how he cre­ated the Bloody Cause­way image. My Twit­ter page — I will fol­low you if you fol­low me — Let’s con­nect — PLEASE email me and tell me who you are in case I don’t rec­i­p­ro­cate because I think you are a spammer. Thanks to D. Lavoie who posted a blog com­ment about our last pod­cast. Thanks as well to every­one that sent com­ments by email about our last pod­cast. Although ALL com­ments are appre­ci­ated, com­ment­ing directly in this blog is pre­ferred. Thanks as well to all the new mem­bers of the bul­letin board. Most of the links to actual the prod­ucts are affil­i­ate links that help sup­port this site. Thanks in advance if you pur­chase through those links. You can down­load this pho­tog­ra­phy pod­cast directly by click­ing the pre­ced­ing link or lis­ten to it almost imme­di­ately with the embed­ded player below. Thanks for lis­ten­ing and keep on shooting! I enjoyed this inter­est­ing pod­cast. I have tried focus stack­ing with some macro sub­jects, but not with land­scapes. I look for­ward to try­ing Michael’s tips. I have vis­ited Giant’s Cause­way twice and can really appre­ci­ate the fine focus stacked image pre­sented in this blog. I look for­ward to look­ing at the tutorial. Thx Enrique! There is loads of room for cre­ative play here! I agree — vary­ing layer opac­ity at dif­fer­ent expo­sure lev­els Orton Style can also be a fun thing to try. As for HDR and focus stack­ing, since they are sep­a­rate processes, no prob­lem to com­bine them. That’s what these soft­ware pro­grams help you do — do this with­out a mask. Of course this is less pre­cise than a man­ual mask — but it’s way quicker and depend­ing on the com­plex­ity of the pic it can often do a fab job. Another excel­lent pod­cast. Many of us are ready to start exper­i­ment­ing with tech­nique. Could this be mixed with HDR? What would hap­pen if we sim­ply stack mul­ti­ple images with­out cre­at­ing a mask? We could even exper­i­ment with dif­fer­ent expo­sure lev­els for each layer hav­ing a final effect that could look like the Orton one… Just speculating.